Call 277-2924 or email amygro@unm.edu to schedule your visit. Although you are welcome to visit our galleries without an appointment, consider a docent presentation. We want your experience to be as positive as possible. Therefore, we limit group size to 30 and we expect four adults to chaperone school groups. Explore the legacy of the Southwest from Paleo-Indian times through the early Pueblo periods. Experience the daily life of ancient people by studying the artifacts they left behind. Your group will dress in replicas of ancient textiles, grind corn, identify pottery styles and weave on basket frames. Investigate our earliest origins as a distinct species! 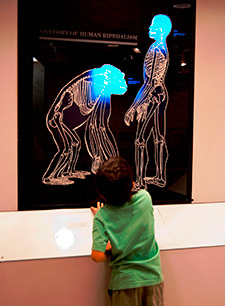 Discover what makes us "human"; that is, what distinguishes us from our primate ancestors and cousins: bipedalism, brain capacity, tool use and manufacture; language and culture. Please check back here later for an update on our new offerings for this exhibition space. Self-guided visits are free. We ask that groups call the education department to check our calendar and assign a date and time for your group, exclusive of any other groups. We recommend large groups divide into smaller groups of about 25-30 total people and stagger their entry every 30-45 minutes. Download our guidelines for group visits. Consider using the following gallery guides for a structured visit for school groups.